– Advertise with a popular influencer that has a large number of followers without taking into account if the influencer’s followers are their brands target audience. 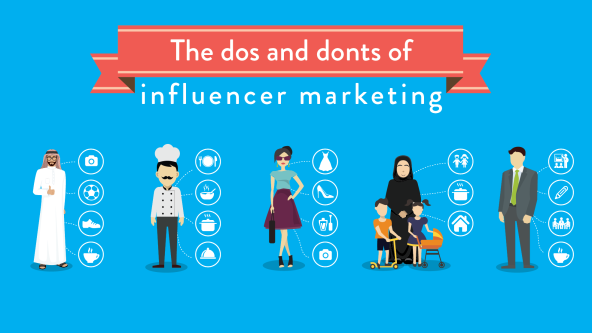 – Work with an influencer whose content is not relevant to the product or service. I like to keep this in mind: influence is not always popularity. Being a fan of the influencer and actually finding them influential are two different things. Influence drives people to take action. So if you’re just looking to raise awareness on a topic or service then by all means advertise with a popular influencer. However, if you’re looking to generate action I recommend going with an influencer that generates authentic content relevant to the product or service you want to promote. A person with 10K followers could have more influence than a person with 200K followers. It all comes down to the quality of their content and their reach. So how do you choose the right influencer? Observe the influencers audience. Are their responses positive or negative? Do they seem influenced? Analyze the influencers content. Do they have the ability to drive action? Is their content and tone authentic? A quick example: if you were promoting chicken broth cubes and your objective is to increase sales, then it would make more sense to advertise with a chef blogger than a very popular instagram photographer. Yes, the popular photographer would have larger reach but the food blogger would generate higher engagement from their followers.